The high in Martinsville, VA should hover just over 40 degrees for the Sprint Cup race here today – although the weather service says it will feel colder and rain is likely. God bless the avid race fans – who bundled up and trekked in the wind and cold and rain to shivver in the stands and watch the Goodies COOL Orange 500. Appropriately named huh? Virgina Tech head football Coach Frank Beamer was supposed to visit here in the media center this morning but ice in Blacksburg, VA prevented his helecopter from flying here – so Beamer was piped in by phone just a little bit ago. Smart move coach. “I like all the Virginia tracks, I know NASCAR is spreading out…but the heart of NASCAR is right here in Virginia,” Beamer told reporters via speaker phone, referring to Martinsville, Bristol and Richmond, Virgnia tracks. In the garage all the crew guys are bundled up – it’s hard to recognize anyone you walk past and hard to fathom what it will be like for the spotters in the spotter’s stand today. Seems like everyone in the NASCAR garage has been sick – the flu is going around and yet the NASCAR show continues to roll – without stop to a city near you. When bad weather hits and we’re hanging out in the rain tents the pit crews put up on pit road or gathered for shelter at the back of the haulers during a red flag rain delay talking with the guys on the teams in the garage – games are played and chops are busted. I can recall one rainy day when the Dale Junior piloted (then Budweiser team) watched as teams began sending quickly crafted boats down the river of rain that began forming in the garage. Suddenly, a massive, engineered model created by the Bud team was put into the stream – and it sailed past all of the haulers – making it further than any other boat that had been tossed into the impromptu contest. Down at the end of the garage where the Bud boat finally stopped one of the team guys on a competing team yelled Juniooooooooor as the boat reached their hauler and everyone behind every hauler within hearing distance burst into fits of laughter. Teams play jokes, come up with games to pass the time, and tell stories when the weather turns bad. It passes time and makes life less miserable on a miserable day. So I’m thinking – what’s the coldest thing that you’ve heard someone in NASCAR say lately? 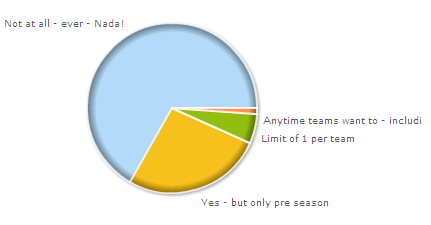 You can start at the beginning of the season. What is the last quote you have heard, something that was quoted of a driver and/or a spokesman and you thought, man that is cold. You start. I am making a list myself. I’ll share it on the air next week. Start talking amongst yourselves. Got one? Posted by claireblang in Live Show. I will be broadcasting my show live from the “Dialed In” mobile broadcast unit Friday in Martinsville at a location easy to access for race fans. Posted by claireblang in My Show. Call into “Dialed In with Claire B. Lang” – which airs on XM Radio Channel 144 (XM Sports Nation)Monday -Friday from 4-7 EST by calling 866.250.8535 or 866.XMSN144 (866-967-6144) during the 4-7 EST hour. Posted by claireblang in Fun Stuff, My Show. 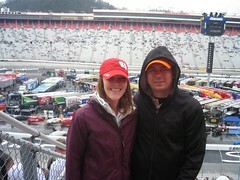 Pictured (above) Brad Knight and his date Amy at Bristol Motor Speedway (3/15/08) Brad called on air during a call segment on my “Dialed In” show on XMSN Channel 144 and unveiled his plans to take his date Amy to Bristol – her first NASCAR race. The phone lines melted down as listeners called in suggestions for Brad on to how to make the first NASCAR race date a success. The follow-up on air segment with Amy showed she was a trooper in the pouring rain and would go back to a race – with Brad! Brad carried the cooler a mile by himself – What a guy! Posted by claireblang in Teams. The team that won 18 of 36 races last year still has not had it’s first victory. Has NASCAR’s new race car created parity? Are the headlines unfairly targeting the Hendrick teams? Take the survey above and we’ll talk about it on “Dialed In with Claire B Lang” on XMSN Channel 144. 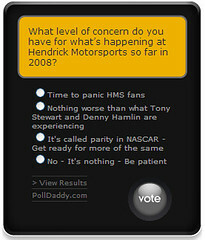 Posted by claireblang in 2008 Season, Fun Stuff, NASCAR Poll. Hey all! Time for a quick Blog poll. 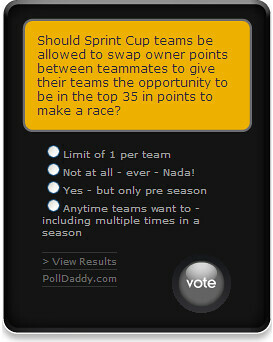 My email box is heating up over the potential of teams to ask NASCAR for the ability to swap owner points to help teammates get automatically into the Sprint Cup show beginning at Martinsville..
Should Sprint Cup teams be allowed to swap owner points between teammates to give their teams the opportunity to be in the top 35 in points to make a race? Vote – and if you are up on the wheel on this topic give me your feedback below as to other options you think would be better or if you have thoughts on the points system related to swapping points that you’d like to share. I’ll discuss them on Dialed In on XMSN Channel 144 (4-7 EST daily) and post results here on ClaireBLang.com and my blog on Infield Parking. Back to the phones getting ready for today’s show! It’s evident here in Vegas that the team guys are in good moods because the weather is nice and they can almost see home from here. The NASCAR Sprint Cup Series test in Phoenix starts Monday and so, post California rain delays, some of these guys have not seen a lot of home lately. This morning, I ran into the hauler driver for Haas CNC Racing – he told me he had been home only one day since Daytona Speedweeks. He also told me that after the race here at Las Vegas Motor Speedway he’s got to drive the hauler to Phoenix to drop off a tool box. He was joking over coffee, while waiting for the valet to bring our cars at the hotel complex this morning, that his stop at Phoenix to drop the tool box will be like a 747 making a drop. He joked that he was going to drive by PIR and push it out the back and keep on driving to beat it on home to his family. HAULER PARADE – Accidents in the line up but crazy for the haulers! The NASCAR hauler parade was so impressive Thursday afternoon that in the garage yesterday the hauler drivers were all saying how impressed they were at the turnout of fans. They were, in fact, blown away by the number of people that turned out to see their gleaming haulers on the strip. Construction workers who left their jobs to walk down and see them come by and folks here on other business and of course the race fans who were beaming with pride at the display. It was a bit of a challenge on the line up I am told as two NASCAR haulers got in accidents with vehicles trying to get in position to line up for the parade. No one was injured but the line up was a challenge with the traffic of the afternoon and so many haulers trying to get where they needed to in time for the parade and then back to the track to line up in the garage. The guys loved it though and so did the fans. The garage has been at peace this weekend. You can sense it when talking with the drivers and hanging out at the haulers with the team guys. Everyone’s happy and joking and in the mood that comes from the sky being blue and the humidity and temperature being low. The winds are kicking up here and some of the guys are mentioning the challenge that the high winds present. Of course with all the accidents in practice – things could crank up during the race if the trend continues. BUSCH BROS. – ADVANTAGE WEST COAST TIME? Pole sitter Kyle Busch had said that he felt he had an advantage over some of the other drivers here at Las Vegas Motor Speedway because he has been living on West Coast time back home in Vegas while other drivers have come back and forth from the East Coast. He says that some of his friends treat him differently now that he’s a NASCAR driver and he says that he tries hard to let them know that he’s the same Vegas kid they knew in high school and they should treat him no differently. KAHNE COMMERCIAL – ALA TIMBERLAKE? Kasey Kahne’s new AllState commercial airs this weekend. If you are a surfer you’ve seen the pictures of him on the internet in uniform looking a bit like Justin Timberlake. He dances in the commercial – in MTV style – in face he’s a dancing machine. It’s so funny to talk with Kahne in the garage about it because up close he’s so not the guy in that commercial. He’s just so not that guy. He’s soft spoken but he’s got a glimmer in his eye and seems to totally enjoying stretching his personality a little. Kahne says it’s getting easier and easier to let loose in the commercials. The new one will air this weekend. Back out into the garage..more later.